Healthy Meal Plans: These 5 Smart Food Swaps Will Help You Fight Off Heart Disease, Cancer, and More – Sense of Urgency! If you’re trying to create healthier meal plans but find it challenging, try a different strategy: Focus on making smart swaps for individual foods. It’s not hard to make healthy swaps if you know the foods that you are better off avoiding. Barbra Heller, RD, a registered dietitian at the Iris Cantor Women’s Health Center at Weill Cornell, provides the following list to help you get started. Red meat: Regularly including red meat in your diet may produce inflammation in your body, which may contribute to hormone-dependent cancers and obesity. High saturated fat intake directly correlates to high LDL cholesterol, which contributes to heart disease, says Heller. Red meat has a higher saturated fat content than white meat, such as skinless chicken and turkey breasts, as well as all varieties of seafood. Replace red meat with other good sources of protein, including beans, peas, lentils, and nuts, which contain little or no saturated fat. 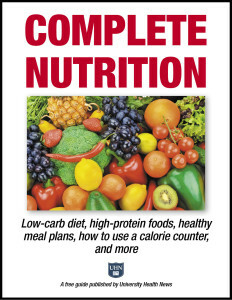 Download this expert FREE guide, Complete Nutrition: Low-carb diet, high-protein foods, healthy meal plans, how to use a calorie counter, and more. Create healthy meal plans and discover the Superfoods that can transform your plate into a passport to better health. Dairy products: Milk and foods made with milk are also high in saturated fat, so when buying milk, cheese, and yogurt, choose reduced-fat, low-fat, or nonfat options. And save butter for special occasions; one tablespoon of butter contains a whopping 7 grams of saturated fat. Vegetable oils and butter substitutes made with vegetable oils are healthier options. Refined carbohydrates: Avoid foods high in carbs that are made with refined grains; they are lower in fiber and nutrients than their whole-grain counterparts. A significant source of refined carbs in the typical American diet is white flour, a primary ingredient in many breads, pastas, crackers, cookies, and baked goods. Instead, select foods made with whole grains. Whole grains also can contribute to better blood glucose control, since they are digested more slowly than refined grains. Products high in added sugar: Sugar, like saturated fat, is very unhealthy when consumed in excess. In fact, the 2015-2020 Dietary Guidelines for Americans advises getting no more than 10 percent of your daily calories from added sugar; that’s a maximum of 160 calories per day in a 1,600-calorie-per-day diet. Soft drinks are notoriously high in added sugar; one 12-ounce can may contain 40 or more grams and 150 or more calories of added sugar. Many other beverages, including fruit drinks, energy drinks, and specialty coffees and teas, are also loaded with sugar, as are candies and many desserts. Fried foods: Frying boosts the calorie content of foods, and there are some reports that frying can produce the cancer-causing compound acrylamide in some starchy foods, such as potatoes. Healthier cooking methods include baking, poaching, roasting, and sautéing. Heller also suggests following a “meatless” meal plan one day a week; she says this is an easy way to start reducing red meat intake and saturated fat. “Substitute beans, legumes, nuts, vegetables, and plant-based ‘milks’ for animal-based foods one day each week, and do it each week so that it becomes a habit. Once you get accustomed to it, you’ll find you enjoy it, and you’ll feel better,” advises Heller. Start off with a strawberry, banana, and almond milk smoothie. For lunch, have lentil soup and a whole-grain roll or slice of bread, or beans and chickpeas mixed with quinoa for a satisfying salad. For dinner, make baked eggplant Parmesan topped with low-fat mozzarella cheese. Make changes gradually. Start with a few swaps the first week, and then continue to add swaps in the following weeks. If you stick with it, in a few months, your meal planning will become easier and you’ll be eating more ­healthfully. The post Healthy Meal Plans: These 5 Smart Food Swaps Will Help You Fight Off Heart Disease, Cancer, and More appeared first on University Health News. Previous: Remember when all the climate change experts warned that winters would be WARMER and snowfall would DECREASE?